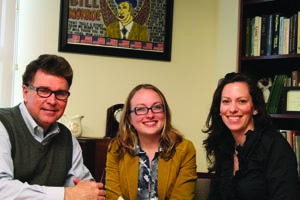 Adopting a model now used by many colleges and universities, Dean Bill Monroe has established an advancement team to integrate alumni relations, development, events, marketing, and communications for the College. 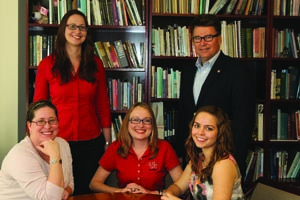 In addition to the dean and Shannon Parrish, now senior director of development, new members of the team include Beth Kungel Borck, the College’s new director of development, Laurie Cedilnik, coordinator of events, and Libby Ingrassia, the College’s communications director. Beth, who joined the staff in January, is an Honors College alumna with over seven years of experience working in the University of Houston System. As a development associate for Main Street Theater, she coordinated the grant proposal process and served on the gala committee. Most recently, she has organized and promoted events for the UH-Clear Lake Career Services Office and collaborated with the University’s Office of Alumni & Community Relations to solicit alumni and potential donors. Laurie, who joined the College last July, completed an MFA at the University of Houston and a 2-year stint as editor-in-chief of Gulf Coast, the national literary magazine published by the Creative Writing Program. Prior to coming to Houston she was on the staff of Newsday, an account executive at Verso Advertising, and an editorial assistant at Penguin. While running Gulf Coast, Laurie had the opportunity to work with members of the Houston community on fundraising, readings, and special events. Libby, also an Honors College alumna, joined the College in January of 2010, soon after completing a Master of Liberal Studies degree at Rice University. As the College’s director of communications, Libby brings valuable experience as a technical writer and a monthly magazine editor, a marketing vice president for a small technology company, a program director for a worldwide user group, and a high school English teacher. Mallory Chesser, coordinator of the Honors and the Schools program, assists with writing, editing, and special projects; Sara Gabler Thomas, a recent alumna and service year intern, provides staff support for the team. Together, the advancement team collaborates with other staff, faculty, and alumni to design and promote major events, such as the Lence Residency and The Great Conversation. The team is currently working to develop the Honors College alumni network and promote the One Thousand Years of Honors campaign.